I love books but I'm not particularly fond of collecting them. I rarely read a book twice and space is at a premium in my home. When S & I married we used to buy lots of books and an Ikea bookcase was the first piece of furniture we bought. After living in Germany for 2 years we went back to the US with two pieces of furniture... an armoire and a bookcase! lol! Twenty years later we're accumulated a quite bit more. I've sold or given away most of my books but there are just some books I can not part with. And as I was unpacking some boxes I found my collection of "soul feeding" books. You know which ones those are... books that friends & family give you or those that have beautiful sentiments written inside. And of course those books that make you feel good or are just such amazing stories you can't part with them. For me, one of those books is "Selma" by Jutta Bauer. It's a sweet little book about happiness. And sometimes you need a little reminder to make you appreciate and love your life. "Happiness? Let me tell you the story of Selma..."
"Once there was a sheep named Selma... Every morning at sunrise, Selma would eat a little grass... She would play with her children until lunchtime...exercise in the afternoon... eat some grass... have a little chat with Mrs. Miller in the evening... and finally fall fast asleep." "Well, I would eat a little grass at sunrise... play with my children until lunchtime... exercise in the afternoon... eat some more grass... have a little chat with Mrs. Miller in the evening... and finally fall fast asleep." "And if you won a million dollars?" she was asked. "Well, I would love to eat a little grass at sunrise... play with my children... exercise in the afternoon... eat some more grass... and it would be nice to have a little chat with Mrs. Miller in the evening... before finally falling fast asleep." " It's when you're loved, cared for, getting attention, playing, and one more thing... feeling special." Love seeing little hearts everywhere. Candy, cupcakes, flowers, fabric, you name it... all in pretty shades of pinks, reds, and purples. I'm drawn to these colors.They make me happy. Love cutting out hearts and making Valentine cards with C.
Reading children love stories to C is especially sweet. The first Love book I bought him for Valentines was "Olive, My Love". 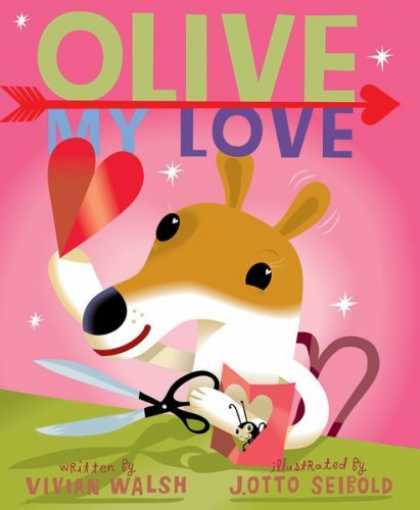 It's a super cute story about Olive's friend, Dexter, declaring All-of (Olive) his love for Olive . This year, I found "Slugs in Love" hard to resist even for this grrrl who detest bugs & refuses to plant an herb garden for fear of slugs. But this story about two slugs desperately trying to find each other was too adorable to past on. And lastly, "Somebody Loves You, Mr. Hatch" is a heart-warming story about a loner who receives a heart shaped candy box filled with a little note that says, "Somebody loves you". Of course Mr. Hatch hasn't a clue who sent him the package. After some thought he begins to think the gift was from a secret admirer. Receiving the package changes his outlook on life... he begins to dress differently, his routine completely changes and he begins to open himself up to the people around him. Mr. Hatch shares his candy with his co-workers, helps his neighbors, and throws a picnic for the children & parents in his neighborhood. After a while, he forgets about discovering the person who sent him the package & note. 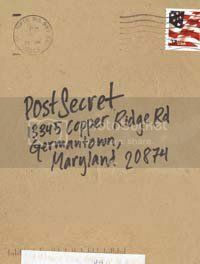 Until one day, the postman comes to his house and tells him he delivered the package to the wrong address. Mr. Hatch is heartbroken and thinks that no one loves him. And sadly, he goes back to his old ways. Now this sudden change throws everyone into a state of confusion until the Postman explains what happened. When everyone starts to proclaim their love for Mr. Hatch, the postman suddenly gets an idea... They surprise Mr. Hatch one Saturday morning with balloons, hearts, and a big sign that says, "Everybody loves Mr. Hatch". It's a beautiful story. Roo de Loo, the street where Julia & Paul lived while in Paris. This month my book club read "My Life in France" by Julia Child. I picked up the book about a year and a half ago and for what ever reason I never finished reading it. So when Baking Grrrl, recommended the book I was excited to start reading it again. And this time... I fell in love with the book. This beautifully written memoir read more like a love story. Through Julia's words you slowly see how she falls madly in love with France... it's food, the people, and their culture. I truly enjoyed reading "My Life in France" and didn't want the story to end. The book also describes moments of her loving relationship with her husband along with bits from Paul's journal & letters to his brother. I loved that Julia married later in life which for her time was such a rare thing. Julia discovered her passion for cooking at a late age as well which I found very inspiring. And what I loved most about Julia was how committed she was to learning how to cook traditional French foods. Since we live so close to France my bookclub thought what better way to celebrate Julia's book than to visit the city she loved so much... Paris! There were three things I wanted to do while in Paris: see her apartment on 81 Rue de l'Universite', eat fabulous French food, and visit E. Dehillerin (Julia's favorite cooking store). And maybe visit one of the Mariage Freres tea shops if we had time. Researching which restaurant we would dine at proved to be a challenging task. Since Julia & her husband loved to dine at 2 star Michelin rated restaurants I began doing research on restaurants that met that criteria. I found lots of great articles on various Michelin rated restaurants along with restaurant recommendations from different travel forums. Some of the things I noticed about these Michelin rated restaurants were that they classified themselves as Haute not Traditional French cooking and many weren't open on the weekends. As I continued my research, I found an interesting article by Gourmet magazine about restaurants in Paris that refused to change their decor, style, or menu. With these restaurants it was all about traditional French cooking. Reading this article made me think... "If Julia were in Paris today where would she dine?" I had a feeling a haute restaurant with crystal chandeliers & enough artwork that made you feel like you were at the Louve was not exactly Julia's perference. Now... a little brasserie tucked into a neighborhood where only locals dined was more along her style. Julia was all about eating good food and didn't really care about fancy, shmancy restaurants. So I put all my efforts into finding the perfect little brasserie. I finally chose the first restaurant mentioned in the Gourmet article, l'Ambassade d'Auvergne. I was a bit worried though... would my friends enjoy the lunch.. would the food be as good as I was hoping? When we arrived in Paris our first stop was 81 Rue de l'Universite' or as Julia like to call it...Roo De Loo, Julia & Paul's apartment. It's a beautiful building tucked away in the 7th Arrondissement, a block away from the Seine. My friends & I would have loved to see the inside of her apartment but seeing that people actually lived there it was out of the question. Julia & Paul occupied the 2nd & 3rd floor of this apartment building (left corner). A little cafe right next to the building where Julia & Paul lived. After we took some pictures we went to Les Deux Magots for some coffee. Being that our reservation was at 1pm I didn't want to eat too much so Greek Grrrl & I split an order of Brioche toast which was delicious. Blonde K, our awesome Parisian navigator lead us to Ladurée a gorgeous little pastry/tea shop from 1862. They're quite famous for their macaroons, two small round cakes with a ganache filling. Every season they create a new flavour. Since the shop was really crowded & I'm not particularly crazy about macaroons I waited outside but after seeing these beautiful photos Greek grrrl took I was sorry I didn't go in. These little cakes are to die for. We then made our way to l'Ambassade d'Auvergne for lunch. When we got closer to the restaurant we saw the maitre d' outside waiting for us and he greeted us with a smile once we told him we had a reservation. Inside the restaurant looked exactly like it did online. I was especially happy when I saw the restaurant filled with what looked like locals. There was not one tourist in site when we arrived. Definitely a good sign. The maitre d' was a sweet little man with a great sense of humor. He definitely made my lunch experience memorable. Before we began eating we all had a glass of wine and I made a toast, "... to Julia, because without her we wouldn't all be here today." For an entree' I ordered the Carpaccio de Veau d'Aveyron à l'Huile de Noix (Veal Carpaccio with Walnut Oil ) which was good but a bit tough. One of the great things about going to lunch with a big group is that you can try other items on the menu. For instance, I tried Kiki's Millefeuille d'Aubergines & Chèvre Frais au Miel de Montagne (Aubergine with Fresh Goat Cheese and Honey) which was fantastic! My friend, the Southern Belle had the Salade Tiède de Lentilles Vertes du Puy (Green Lentils Salad with Bacon) which was incredible! I've never tried lentils before so this was a great introduction. Now I can say I feel in love with lentils in Paris! lol! As my main meal I had the Cuisses de Canette Rôties, Poires & Figues au Caramel de Marcillac (Roasted Duckling Leg , Pear & Fig with Wine Caramel) which was good but there was no Wow factor. And for dessert most of us ordered the Mousse au Chocolat. A few of the girls like Blonde K, Baking Grrrl, and Greek Grrrl had the Saucisse de Parlan & Aligot (Country Sausage & Aligot with mashed potatoes and Laguiole cheese, garlic) which l'Ambassade d'Auvergne is known for. I definitely made it a point to try the Aligot and it was quite delicious. But the presentation of the Aligot was even more fun to watch. Throughout our meal the maitre d' scrutinized our plates to see if we ate everything and if we didn't he joked about not letting us order dessert. One of the things I loved about the restaurant was that some of the dishes were served family style like the Salade Tiède de Lentilles Vertes du Puy & Mousse au Chocolat. I'm not sure if this is normally done or perhaps it was because we were such a big group. Nevertheless, I loved it. After we finished our lunch we headed over to Julia's favorite cooking store, E. Dehillerin. This is a no frills cooking store that has everything imaginable. It's a cook's dream. The store doesn't look like it's changed one bit since it opened back in 1820. When you enter this shop it's a bit dark and there are copper pots lined against the wall for you to choose your favorite. There are no prices listed on the items instead you have to look at a catalog to find the prices yourself. Of course, the sales people will gladly help but I didn't want to be THAT needy, American who couldn't do things herself.lol! The aisles are very narrow and a bit dusty but selection of cooking items is impressive. Every imaginable pastry mold and pan you could ever desire along with a wonderful selection of knives, cooking utensils, silicone molds can be found here. Lined from floor to ceiling are metal & copper containers and the wooden shelves are filled with products stacked not in the most stylishly manner but it really adds to E. Dehillerin's atmosphere. The sales people work on commission so my guy was quick to grab me and begin listing my items on a receipt. I'm not sure if my friend Kiki knew they worked on commission because when the salesman saw that she was working with another man he yelled, "Why do you ask me questions, when you are working with him!" I told Kiki, "They work on commission here and they take it very seriously." I can understand why when some of the pots are so costly. I was actually quite surprised by how helpful and nice the sales people were considering I read an article several months ago that painted a completely different picture. One of the items I was hoping to buy was a mini Cocotte by Staub but when I saw them I started to think I needed more than just a mini. I was a bit concerned about lugging around a big, heavy cast iron pot all over Paris. I kept going back & forth - should I get it now or should I wait & buy it when I visit Paris with S. After talking to Kiki I decided to get it. The mini oval pot wasn’t too heavy and was perfect for cooking & serving hot dips. I couldn't find the price in the catalog but I didn't think it would be too far off from the prices I saw online. When I gave my guy the Cocotte he even had a hard time finding the price so another man went looking for the price in another catalog. Once he found the price he wrote it down on my receipt and gave it to me. When I looked, he wrote 79 Euros and change. Wow, was I wrong? Could this be right? I asked the man who wrote down the figure and he said, "Yes, it's correct. That pan is a very good pan. It is cast iron." When I looked at my notes with all the dollar prices for the various Cocottes I saw that I'd written $75 dollars for the small oval pan yet with the conversion rate I'd be paying $115 American dollars. There was no way I wanted to pay that much but I was a bit hesitant about telling my sales person I didn't want it. But that's a $40 difference... for that I could almost buy 2 Cocottes online. So I gave the pot back to my guy and told him I changed my mind. He was good though and just crossed it off and fluttered his eyes at me. There was no yelling involved so I was a happy girl. After I paid for my goodies which included a silicone flan & bundt cake pan (with 3 different designs), a little knife to make slits in home-made bread (just 3 Euros...I have no idea when I'll use it but just in case I decide to make my own bread I'll be prepared), and an olive wood spice container. The guy wrapping my items was a flirt and told me, "You live in Belgium but you don't have a Belgian accent when you speak French." I told him, "I don't think I have a Belgian accent because I don't speak that much French." With a big smile he said, "Then you must live in Paris for a few months"
I said, "Ooooohhh, I would LOVE to live in Paris for a few months." Speaking with the cutest french accent he says, "But you can not have these American friends. You must get a French boyfriend!" Jokingly, I told him, "Ok! As long as you find one for me!" lol! After we left E. Dehillerin, we made our way to Fauchon. There were so many yummy things I wanted to try. Lots of cool spices, olive oils, teas, cookies, and chocolates. But I was good and bought a really cute pink silicone mini canelé pan and 2 bottles of jams (strawberry with rose petals and pineapple coconut). We still had some time before our train ride home so we made a stop at Mariage Freres, my favorite tea shop. Casablanca: A fine marriage of green tea with Moroccan mint & bergamot flavoured tea. A refreshing surprise. "Play it again"
Chandernagor: A successful blend of spices commemorating a famous French trading post in India–cloves, cinnamon, ginger, cardamom, and pepper. Wedding Imperial: A glamorous blend is steeped in the passion that weds the malty power of golden Assam tea leaves to the sweetness of notes of chocolate and caramel. As you can tell from my favorite teas I'm definitely a spicy kind of grrrl. The boxes of tea are great when your guests want to try different types of tea plus the tea leaves are beautifully wrapped in muslim. But the loose tea is a bargain compared to the bags. 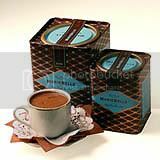 I bought 200 grams of the Wedding Imperial and Noel which will be perfect for the holiday season just a few months away. I also wanted to try a little of the Abricot tea which I think will be great served cold. I bought a gift for one of my girlfriends back home too and the saleman gave me a sample of the Vivaldi tea. It was a nice surprise! We left Mariage Freres and a few of the girls stopped by a wine shop and then it was off to the Gare du Nord. Yesterday I went to Paris with friends from my bookclub to celebrate this month's book... "My Life in France" by Julia Child. We had an amazing day and enjoyed the day just as Julia would have... Eating good french food, visiting E. Dehillerin, and buying fabulous foods & cookware. Will write more on my trip & post photos tomorrow. Last Thursday I hosted my monthly book club meeting. The book I chose for February was "Geek Love" by Katherine Dunn. It's a very interesting story but not for the faint of hearts. I knew that when I chose it. In my group, I encourage members to chose books that are outside of their comfort zone. Reading books that challenge our beliefs and ideas makes for a good book discussion. How boring when everyone agrees that they love the book and there isn't a spark of controversy. When I chose "Geek Love" I knew some of our members could possibly find the story line a bit difficult to read. The story focuses on a family who own a traveling carnival & decide to breed their own freak show by creating genetically altered children through the use of experimental drugs. At the beginning of the book, Lily, the mother in "Geek Love", muses "What greater gift could you offer your children than an inherent ability to earn a living just by being themselves?" It's a bizarre tale. And the more I read the more I was convinced no one was going to show up for the meeting! It reminded me of Rohinton Mistry's book, "A Fine Balance" which by the way is a fantastic read. In this story, there is so much tragedy that you think things couldn't possibly get any worst but unfortunately they DO. "Geek Love" was similar except the story kept getting weirder and weirder. "Geek Love" is really the first book I've ever chosen where I thought, "Oh, god what are these ladies going to think of me for choosing this book" especially since many of our members don't really know me. I remember speaking to my girlfriend a few days before the meeting and I said, "I really don't think anyone is going to show up to the discussion!" Her response wasn't exactly the most positive. She said, "Whatever you do don't clean your house or make anything special to eat." haha I couldn't do that though it's just not my nature. But our discussion that night did start when one of our members said to me, "I want to know... what was behind you choosing this book?" Since most of the story in"Geek Love" takes place at a carnival I thought it would be fun to do a carnival theme. I cooked a variety of goodies traditionally found at carnivals & festivals and tried to elevate these already delicious dishes to an Epicurious level. I started thinking... pizza, hot dogs/sausages, ice cream, fried dough, candy, popcorn, and lemonade. I even looked into making home-made cotton candy but decided I was getting a bit carried away especially when I saw the recipe. My menu for the night included BBQ Cilantro Grilled Chicken pizza (sorry no photo... pizza was consumed too quickly) and Sausage Turnovers-Phyllo dough stuffed with German sausages, caramelized onions, and apples. I also made my Rosemary Prosciutto Quesadillas. You probably won't find these at a carnival but they were just too good to pass up. Look at that rosemary. Beautiful. Fresh is always best but dried rosemary works well too. The rosemary sauce is what turns these quesadillas from good to amazing! I also made home-made lemonade with Vodka & Rum on hand in case anyone was interested in spiking their drink. And of course I decorated the table with candy... Valentine hearts, red Swedish fish, M&M's, and gummy candy alphabets along with yummy Salt & Pepper popcorn. For dessert, I made these... a Brownie & Chocolate Chip Cake with a Ganache frosting. Things couldn't possibly get any more sinful than this. In the end, we had a group of seven ladies beside myself. Unfortunately, only five of us read the book and of those five only three actually finished the book. I do hope the discussion we had that night encouraged some of the other ladies to give the book a try. I found the story fascinating & in my book when a writer can make ordinary actions like walking or going to sleep sound completely grotesque and bring an image to mind that is absolutely unforgettable I consider that pretty amazing. "Those entering the world of carnival freaks will find no escape from a story at once engrossing and repellent, funny and terrifying, unreal and true to human nature. Dunn's vivid, energetic prose, her soaring imagination and assured narrative skill fuse to produce an unforgettable tale." When my book club chose "The Pillars of the Earth" as our September book selection I immediately started having flash backs of "Anna Karenina". Let's just say "Anna Karenina" wasn't one of my favorite books. I never even finished the book. I'm amazed I read over 600 pages despite my waning interest. So reading another 900+ page novel wasn't exactly on the top of my "Must Read" list. But as I read the author's introduction I started to think "The Pillars of the Earth" would be different. And it was. I absolutely loved it. Traveling through Europe and seeing so many beautiful churches gave me a different perspective on the book. I've often wondered about the people who built these churches. Who are they? What kind of lives did they lead? What drove them to build churches? Sure we read about the people who funded the finances to create churches but rarely do we learn about the real people who design and build these churches. "The Pillars of the Earth" is a fascinating story about these people and the life they lead during the 12th century. One of our members recently visited Villers Abbey and thought it would be a great place to discuss the book. So in the spirit of the book, we decided a field trip was definitely in order. When we arrived at the Abbey there was a small Brocante going on just like the open markets mentioned in the book. We had a lovely picnic while we talked about the book. Afterward we explored the Abbey and enjoyed the gorgeous fall day. Last fall I finally got off my bum and started a book club. We've been meeting for 4 months now & I'm excited to report things are progressing really well. Everyone in the group is great and our discussions are lively & thought provoking. Yesterday we discussed "Moloka'i" and for me it was one of the best discussions we've had since reading "A Thousand Splendid Suns". I absolutely loved "Moloka'i". It was a touching book; one that made me cry and helped me see how people can find enjoyment in life despite the constant hardships they experience. What I loved most about the book were the beautiful folktales and Hawaiian traditions weaved into the story. I loved it so much I'd read it again and I rarely ever read the same book twice. After I finished "Moloka'i" I asked S, "Is there ANY way you could get transferred to Hawai'i?" I'd love to pack up, live in flip flops & shorts, enroll in a few classes to learn more about Hawai'i's culture and history, and explore all the islands. It's fascinating.